2. To develop Ss’ listening and speaking ability. Question 2: In what way do you consider a man is a great? What is your standard?
? Look at page 33 and then ask the Ss if these famous people are great people. A great person is a person who has followed his or her ideas and sacrificed(牺牲) something so that they could be realized. A pop singer may be very popular with the young people, but he/she is not a great man/woman. A famous person may be well-known but if he or she has not gone through struggles and difficulties for their noble aims, they can not be called a great person. E.g. He devoted his life to promoting world peace. He devoted his life to the promotion of world peace. The manager devotes all his spare time ______ the violin. E.g. We will have to fight against difficulties. I’ll fight with you, in other words, I’ll support you. Slaves were fighting for freedom. e.g. He has decided to give up smoking. e.g. You can’t win the game, so you may as well give in. 1) To have Ss learn about some information about Nelson Mandela and the situation where the black was badly or unfairly treated. 2) To get Ss to learn about reason why Nelson Mandela helped the black people to get the same right as white people. Read the title of the text and guess what kind of writing the text is. (Narrative writing) Step2 scanning: read the text quickly and then decide how many parts this text can be divided into and then give the main ideas of each part. Part 2(Para.3---5) The change of Alias life after he met Nelson Mandela and what Mandela did. Scan the test specific information to finish comprehending part. 1. The time when I first met Nelson Mandela was a very difficult period of my life. when在句子中引导的是时间定语从句。when指时间，在定语从句中做时间状语： e.g. I still remember the day when I first came to the school. The time when we got together finally came. 2. It was in 1952 and Mandela was the black lawyer to whom I went for advice. e.g. I have advised you on that subject. e.g. Our monitor advises me to practice more spoken English. e.g. I advise waiting until tomorrow. e.g. I advise that you (should) not eat fruit that isn’t ripe. 3. …and I worried about whether I would become out of work. e.g. Jim has been out of work for months. The number of people out of work reached 300. 4. The last thirty years have seen the greatest number of laws stopping our rights and progress, until today we have reached a stage where we have almost no rights at all. e.g. The last few months has seen more and more traffic accidents. The city has seen many changes. 5. We were put in a position in which we had either to accept we were less important, or fight the government. 译：我收到了他的邀请, 但我没有接受。I received his invitation, but I didn't accept. e.g. Only by practicing a few hours every day will you be able to master English. Only in this way can you solve the problem. e.g. Only he knows the answer. Only when a child grows up does he understand his parents’ intentions. Only when the war was over in 1918 was he able to get happily back to work. 2. Get Ss to learn to ask for opinions and give opinions. 3. Get Ss to learn attributive clauses based on the former study of unit4. 1. Get Ss to improve their skills of skimming and scanning. 2. Get Ss to use the attributive clauses correctly. 3. Get Ss to express their ideas clearly. 2. Get Ss to set up the awareness of great people and learn some good qualities of the great people. be devoted to doing sth.献身于……. e.g. He devoted himself to his research for his whole life. e.g. 1. She has been out of work since last month. 2. The horse was out of control and ran away. e.g. Most of us voted for her, so she was elected as chairman of Students’ Union. 1. be devoted to doing sth. 3. be equal with sb. 2. Ss discuss with their desk mates about the qualities that a great people has, and then to stand up and give their own ideas. The T introduces the six famous people to Ss, and then Ss decide whether they are great people or not. 1. Ss read the passage and divide then whole passage into two parts(the T provides them two choices and they match them ) in 15 minutes. After that, the whole class checks the answers together. 2. Ss read the whole passage again and complete the multiple choice on their workbooks in 10 minutes and then ask 5 students to give their answers. 1. 1).Ss read the first paragraph together, and then the T explains the key language points to Ss. After that, ask some students to translate some key sentences. 2. 1).Ss read the second paragraph together, and then the T explains the key language points to Ss. After that, ask some students to translate some key sentences. 2. 1).Ss read the third paragraph together, and then the T explains the key language points to Ss. After that, ask some students to translate some key sentences. 3. 1).Ss read the fourth paragraph together, and then the T explains the key language points to Ss. After that, ask some students to translate some key sentences. 4. 1).Ss read the fifth paragraph together, and then the T explains the key language points to Ss. After that, ask some students to translate some key sentences. Ss complete the true or false exercise on page 35, then ask six students to give their own answers. 1. Why could Elias get a job after get out of the prison? 2. Why did Elias lose his job later? Ss read the passage and find the answers in 10 minutes. 1. It was a prison from which no one escaped. Eg.The soldier escaped from the enemy's prison. e.g. He got a reward for helping them. Ss complete the chart on page 39 in 5 minutes. 1. Ss retell the life of Elias according to the time line of this passage. 2. Ss finish the exercise in the workbooks. e.g. I’ll never forget the time when we worked on the farm. e.g. The hotel where we stayed was very clean. e.g. The reason why he was late was that he missed his train. eg. 1. the date when/on which we attended the meeting was June 18. 2. Great changes are taking place in the city where/ in which we live. 3. Is that the reason why / for which he was late for school? Eg. 1.I’ll never forgot the days when I played with you. 3. The factory(that/ which) we visited yesterday was built last year. Eg. 1.This is the room in which we lived last year. 3. This is the person from whomn I borrowed the English novel. Eg. Is this book which she is looking for? eg. 1.I remember the day on which I joined the Party. 3. He has two daughters, one of which is a nurse. Ss complete the exercise about attributive clause. The lives of some great people. The school where I studied only two years was three kilometers away. This was a time when you had got to have a passbook to live in Johannesburg. The reason why I got a job was because of my hard work. …we were put in a position in which we had either to accept we were less important, or fight the Government. The person to whom you should be grateful for a peaceful South Africa is Nelson Mandela. What are the qualities you should find in a great person? Who do you think is a great person? 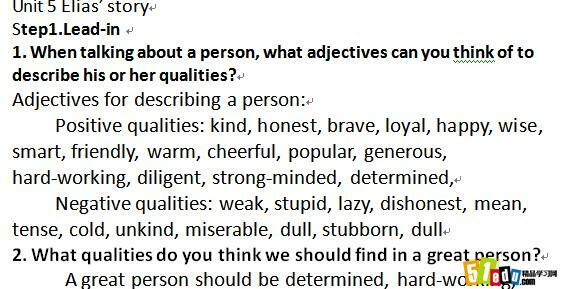 What qualities do you have? 2. Ss finish the chart on page 33. 1. Show Ss some pictures about some famous people and let them discuss who are great people. 2. Ask Ss to tell why they are important persons or great people. 1. First listening: Ss read the text and finish comprehending 1 on page 35. 2. Ss read again and make a timeline of Elias’ life until he met Nelson Mandela. 3. Ss read the whole passage and see how many parts the text can be divided into, and give the general idea of each part. The life of Elias’ before he met Nelson Mandela. The change of Elias’ life after he met Nelson Mandela and what Mandela did. How the ANC Youth League fights the Government? What can we learn from the text about Nelson Mandela? Get the Ss to learn more about Nelson Mandela. 1. When did Elias lose his job? 2. Does Elias like his present work? 1. Recite the key sentences in the text.